This entry was posted in Articles and tagged Bangladesh China refugees United Nations on December 3, 2018 by Liberation. While the world has been rallied to the moral and humanitarian case to support the Rohingyas in their flight from ethnic cleansing by the Myanmar state and their plight in Bangladesh, let us not forget the geo-politics of their situation. 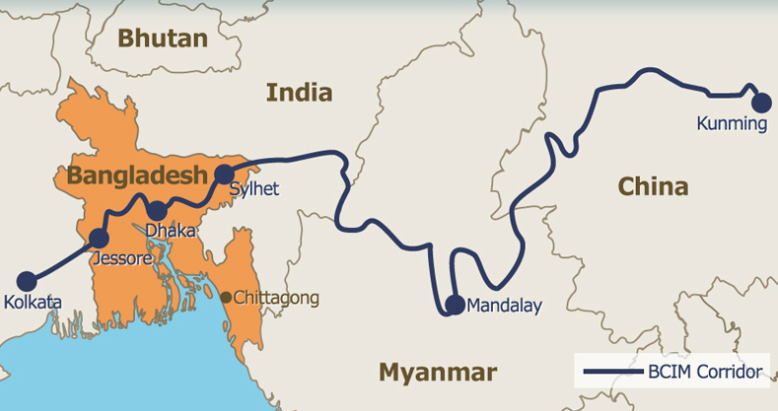 Notwithstanding the grandstanding of the Security Council at the UN, it is the Chinese Belt & Road initiative and in particular the pivotal place of Bangladesh within the Bangladesh-China-India-Myanmar (BCIM) corridor that has determined the recent initiative by the Chinese. This is one part of the Chinese efforts to rebuild the Old Silk Roads across the whole of the Euro Asia land mass, enhancing trade and interactions across the whole of the continent, shifting the central of world economic activity into the heart of Asia, through a process of Easternisation. This is best illustrated by the rush of the Bangladesh Foreign Secretary to undertake a bilateral agreement with Myanmar for the safe return of the Rohingyas to Rakhine state, after Bangladesh had been pursuing a multilateral solution through the UN. 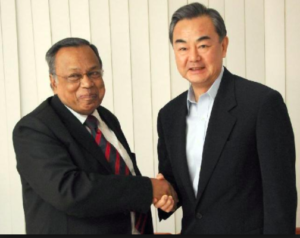 This happened almost immediately after the Chinese Foreign Secretary Yang Yi came to Dhaka to meet AH Mahmood Ali, the Bangladesh Foreign Secretary. So you could say the Chinese brokered or at least kickstarted the bilateral deal. According to the bilateral agreement we have three phases to address the crisis and promote stability. Firstly, China has asked Myanmar’s army to restore order by declaring a ceasefire to stem the flood of refugees. In the second stage, China has suggested that both Myanmar and Bangladesh should be encouraged to talk so as to find a feasible approach to settle the issue while the international community should play an active role as well. In the third stage, Wang called upon the international community to help rebuild Rakhine state. The Chinese Foreign Secretary can be credited for getting the support for the proposal from Myanmar’s civilian and military leaders as well as the government of Bangladesh, before unveiling the plan. The proposal, if implemented, would pave the way to restoring peace in the region and rehabilitate all the refugees who had fled to Bangladesh and other countries. And while some may be cynical about the Chinese involvement given it has not condemned the ethnic cleansing, China at least does have a firm handle over Myanmar because of its economic support. So it can put pressure on the army to stop further atrocities. Furthermore, the Chinese $25 billion offer of infrastructural investment based on the corridor to the Bangladesh government already before the Rohingya tragedy would have played very heavily on the minds of officials in Dhaka. If we can feed 170 million people, we will be able to feed them as well. With an election looming by the end of January 2019 (tentative date being the 27th of December 2018) there is no doubt the issue of how to host the Rohingyas will come up during the election. As a responsible government, it has opened its border and provided shelter to the forcibly displaced Rohingyas. By doing so, it has not only saved lives, but also stabilised the entire region by containing the crisis within their border. Now given the scarcity of land and other socio-cultural and environmental impacts, the Bangladesh government is going to relocate Rohingyas to a newly developed island, Bhashan Char, where they would have better living conditions and livelihood opportunities. These plans to put them on this island in the Bay of Bengal have proven popular amongst the Bengali electorate, though not necessarily globally, while we hear stories that allege that more than 200,000 Rohingyas have been able to get hold of Bangladeshi passports by corrupt means that have somewhat shocked the Bangladeshi electorate. The Bangladeshi PM at a recent UN Conference on Global Compact on Refugees reiterated that the Rohingya crisis has originated in Myanmar and the solution has to be found there. So Bangladesh would like to see the Rohingyas returning to their homes with safety, security and dignity. But pending their return, Bangladesh will try to address their basic needs.